In my live performance tool Instant Decomposer I use amplitude compression and limiting at several points in the signal flow. At the input side, it helps my voice to sound closer and more detailed. At other points it regulates submix levels. While I am doing amplitude regulation anyway, I take the opportunity to expand the lowest amplitude range and thereby attenuate background noise. The compander is an expander/compressor/limiter. This is all done with an experimental technique using an analytic signal, to which the title 'quadrature compander' refers. Below is an example plot of input-output amplitude mapping with expansion, compression and limiting in one smooth curve, as compared to linear amplification. At this point, it is important to define 'signal amplitude', the entity to be mapped from input to output with a non-linear curve. The regular way of computing amplitude of an arbitrary signal is by computing the root of mean of squared sample values (RMS) over a specified time interval. That time interval should match the lowest audio-frequencies in the signal, to avoid falsely recorded amplitude modulation. There is also a method to compute instantaneous amplitudes, with help of an analytic signal. An analytic signal consists of two phases, the second of which is sometimes called quadrature phase. Hence the title quadrature compander. Apart from the popular frequency shifter, this was the first occasion where an analytic signal appeared to be of practical use for me. The advantage of instantaneous amplitudes is the fast detection of a sudden amplitude rise. Since the measurement delay with the analytic signal is frequency-dependant, there is no practical way to sync the amplitude curve with the original signal. To cut things short, I decided to use the analytic signal itself as the audio, by summing real and imaginary phases and reduce the resultant amplitude with factor 1/sqrt(2). Then, the measured amplitude will by definition always exactly match the processed signal. This procedure will completely ruin the phase relations within the signal. A cardinal sin in dsp land. Will the summation of the real and imaginary phase not cause phase cancellations, and thereby reduce or even eliminate some frequencies? No, it will not, because real and imaginary phases are orthogonal, and thus complementary in the summation. Further down, I will discuss the implications in more detail. For the moment, I will just employ my brutal shortcut and continue with the amplitude compander. All compound signals, harmonic recipes included, display amplitude modulation. The amplitude compander must be made insensitive to periodic amplitude modulation. With the RMS method, this can be done simply by selecting the appropriate time interval: twice the period of the lowest harmonic tones in the signal. That can be quite long. One disadvantage of fast compression/limiting can be the muffling of transients. Compressed percussion may sound less powerful. Therefore it is sometimes opportune to deliberately slow down the compander response a bit, and let transients pass with their full strength. For similar reason, compressor release time can be slowed down. 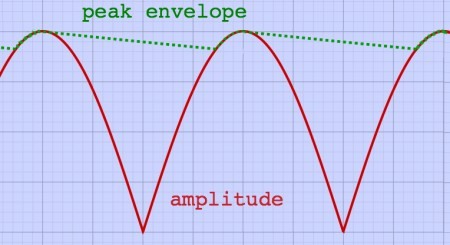 Transient peaks are then followed by an amplitude depression, making the peaks stand out. Such producer tricks make sounds interact with each other, and even a limited set of sounds can result in lively music. With only four user parameters the quadrature compander is complete. I have implemented the scheme as a Pure Data abstraction [qompander~]. It's use is straightforward. The rotation point parameter is called compander point and for ease of use it is set in deciBel with a range of -96 till -20 dB. The patch contains some subroutines, of which [pd exponent] and [pd mapping] are shown below. The subroutine [pd pyth] does pythagoras to find the amplitude. [pd olli~] is my Pd implementation of Olli Niemitalo's quadrature transformer, using biquads. This could be done much more efficient in a specialised Pd class but I have not done that yet. You can download [qompander~] and a help patch from the page bottom and use it if you have Pure Data installed. Higher up I mentioned my brutal shortcut which came in handy for the quadrature compander: summing the phases of an analytic signal and using this as the audio. Phase relations within the signal will be heavily distorted by this action, which is reflected in an altered waveform. It is funny that I have never heard a difference though. Let's see what is going on. Below is an example of a signal with two harmonic frequency components which I ran through the quadrature summator. Input and output sound completely identical, although their waveshapes differ. The frequency content has not changed. I know that the ears and brains are not sensitive to static phase information, but then why are dsp engineers always so zealous when it comes to linear phase filtering? Well, it is clear that you cannot recombine the output with the original. There will be phase cancellation effects, and thus unintended filtering. That is one thing. You must not use the original signal and the quadrature compander output in parallel. When I compare these sounds in ideal listening conditions, I notice a subtile increase in high frequency content at the attack, caused by the tiny blob that arose from the phase rotation. This effect is so minute, that I can not perceive it in normal music listening situations. But when the signal is heavily compressed, such artefacts become noticeable. If you want to do 'parallel compression' with the quadrature compander, an extra action is required. Just like you would normally account for the latency of a compressor, by adding equivalent delay to the original signal, you would now add the analytic summator routine to the original signal. Or else you could run the original signal through a second quadrature compander with moderate settings. I am quite satisfied with the quadrature compander, particularly because of it's fast response. Therefore I will put up with the inconvenience of phase rotations and use an extra compander in case of parallel processing.